Magic-themed slots are a rare breed in the online slots business and I have to be honest, I think the closest I’ve come recently to reviewing a slot with a magic theme was the Frankie Dettori’s Magic Seven slot from Playtech… and well, that doesn’t really count. So it is great news that online slot developer Ainsworth have decided to release a new magic-themed slot in the form of this 5 reel, 50 pay-line effort called Sheer Magic. As Dynamo and David Blaine cause a stir on the streets of London and New York respectively, Sheer Magic is creating just as much buzz online. It might not be able to remain in a box for days or push a mobile phone through solid glass but this slot has its own little endearing traits. Let’s get to the facts. The crystal ball symbol acts as the Wild and it substitutes for all other symbols across the reels to complete winning combinations and increase your chances of hitting some pay outs. Is the hand really quicker than the eye? You probably won’t care if you hit five of the magic hand Wilds across the reels! The Scatters are represented by the magic coin symbols. 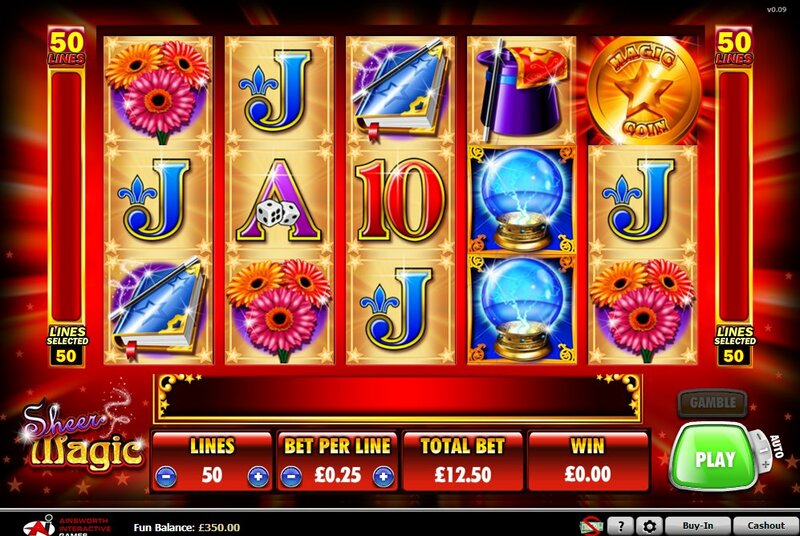 If you hit three or more of these across the reels then you will be awarded with 10 free spins. During these free spins, if the crystal ball Wild symbol lands on an active pay-line it will substitute with any other symbols except for the magic hand symbol to complete winning combinations. The magic hand symbol essentially acts as an Expanding Wild in the free spins bonus round so keep an eye out for them appearing on reels 2, 3 and 4. If you manage to hit three or more crystal ball Wilds during the free spins then you will earn an extra 5 free spins. Other symbols on the reels include magic flowers, a magic hat, a magic book, a set of magic cards and a set of magic cups. Ok, so they might not all be magic but I am assuming they have some relevant magic powers! There are also the standard 9 through to Ace symbols included. Sheer Magic feels like it has potential to be a much better slot. Magic is a genre that I feel is very underused in slots and I was very surprised that this slot did not have a Pick ‘em Bonus or a more interactive bonus feature than just a simple free spins bonus round, especially because magic is all about trickery of the eye which could be used well as a bonus feature. Anyway, it’s still an enjoyable slot and I found it fairly easy to trigger the free spins bonus round and that is where the real fun on this slot is. 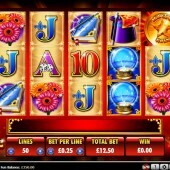 If you are looking for more of the same then check out WMS Gaming's Magic Wand slot.